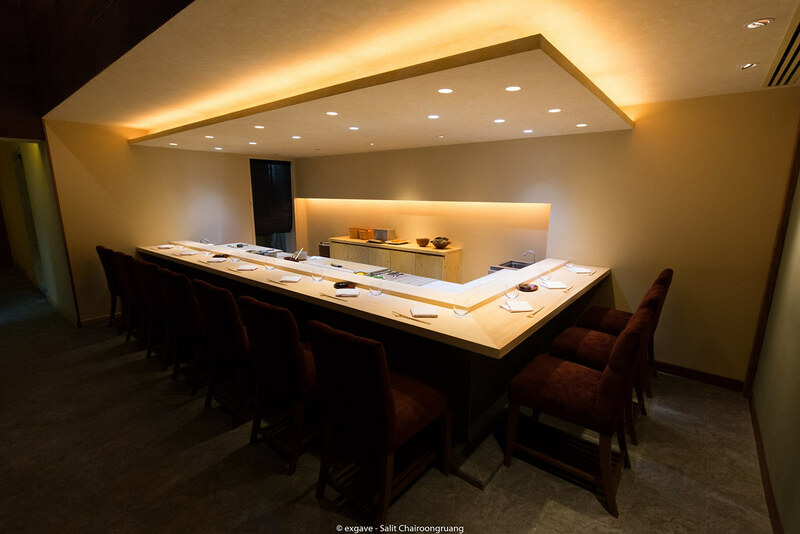 Become a hype of sushi lovers in Bangkok, Sushi Masato has been discretely opened in Soi Sukhumvit 31 since early January 2016. 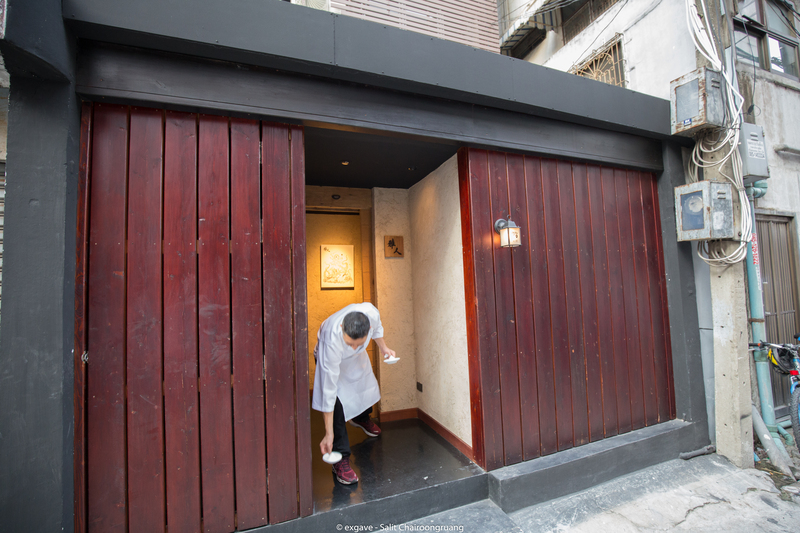 This hidden gem runs by chef Masato Shimizu who used to run his restaurant in NYC before moving to Bangkok last year which was awarded one Michelin star. 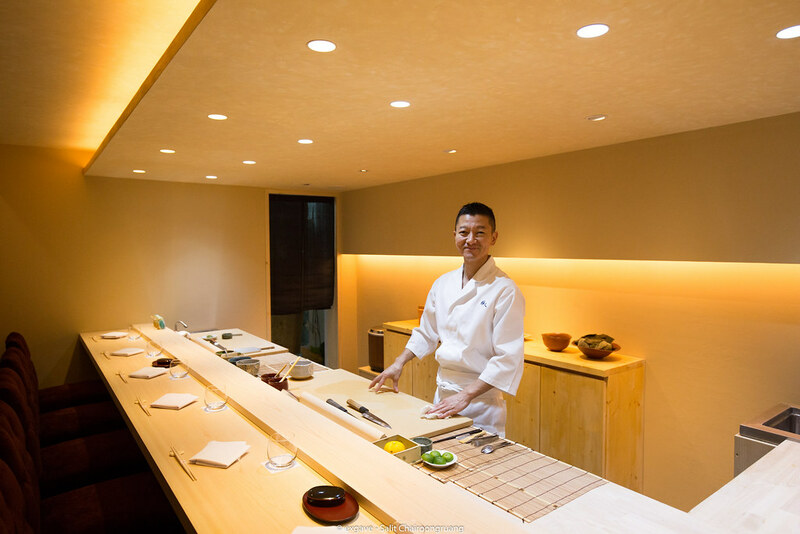 Chef Masato offers an authentic omakase experience without flying a long way to Japan. 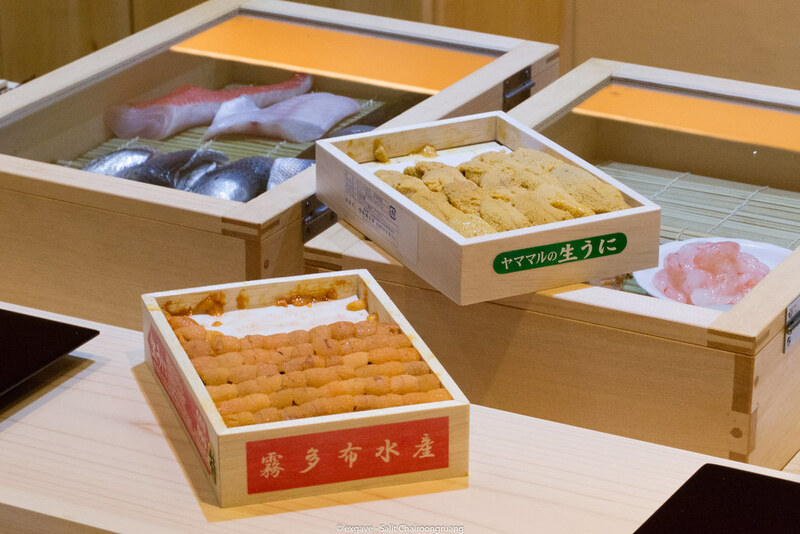 Needless to mention, most of ingredients are imported directly from Japan 5 days a week. Service is very helpful, polite, knowledgeable and super friendly. 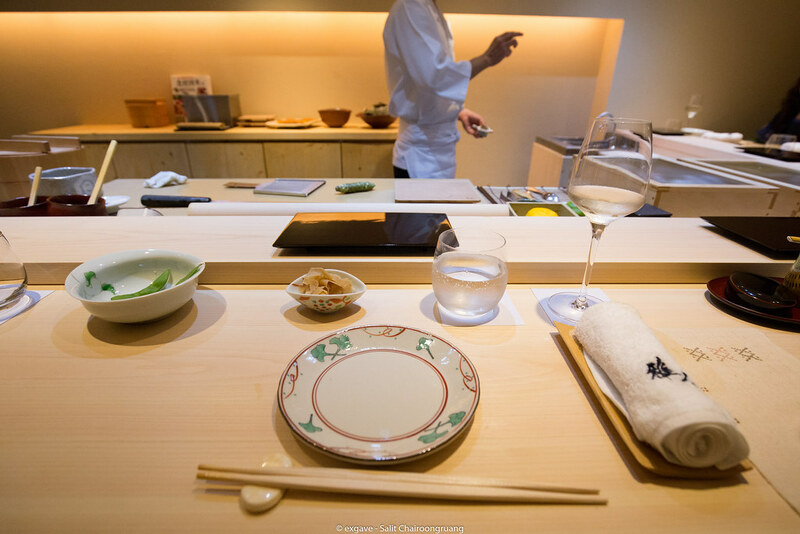 Staffs did not burden me with any heavy feeling like Ginza Sushi Ichi Bangkok. 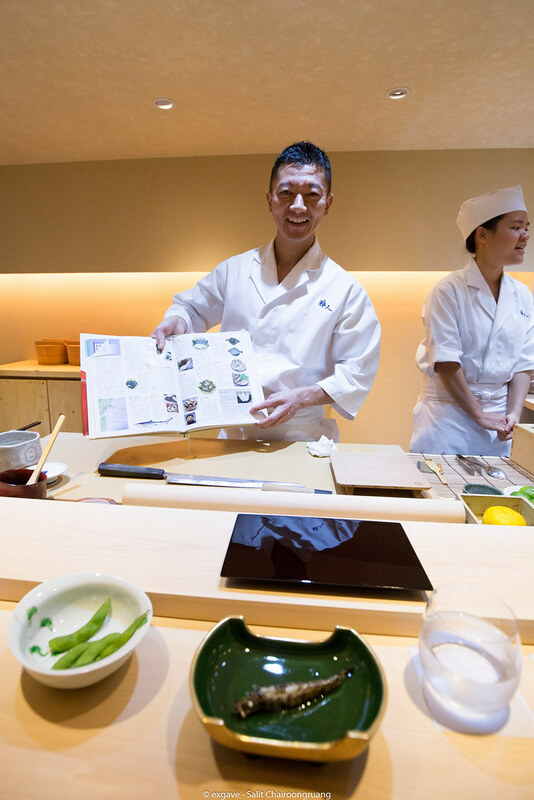 There is no language barrier between chef Masato and diners; chef Masato has excellent English skills. He explained every single dish to diners clearly. There are only 10 bar seats in the restaurant. This place is decorated in Zen style. 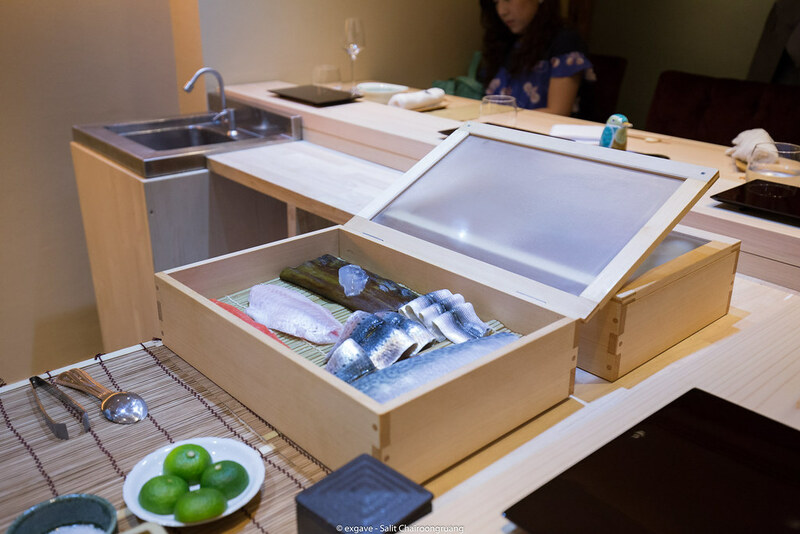 During the soft opening, Sushi Masato offers only one option which is a 3000++THB omakase. 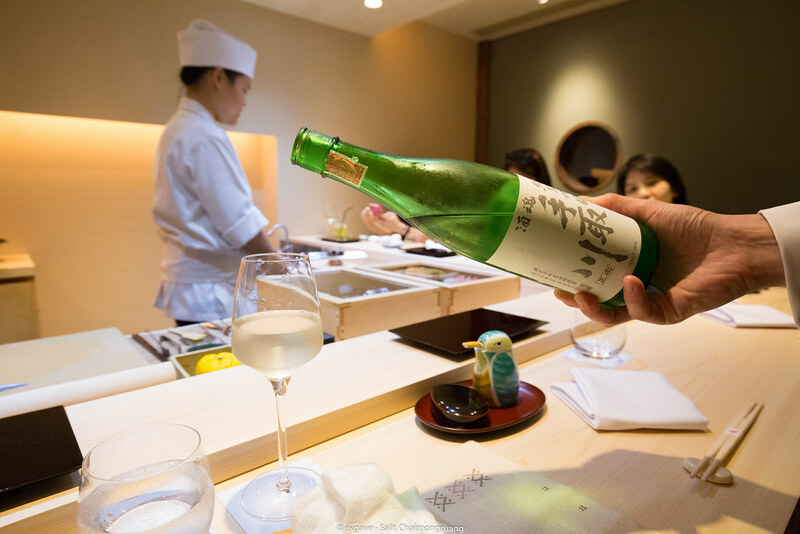 Chef Masato uses red vinegar to flavour the shari (sushi rice). Of course, rice and vinegar are imported from Japan. I did enjoy every single course I’d to say. I might have overjoyed the sushi too much since there is no good sushiya in Sydney, err perhaps in Australia. He executed every dish magnificently. 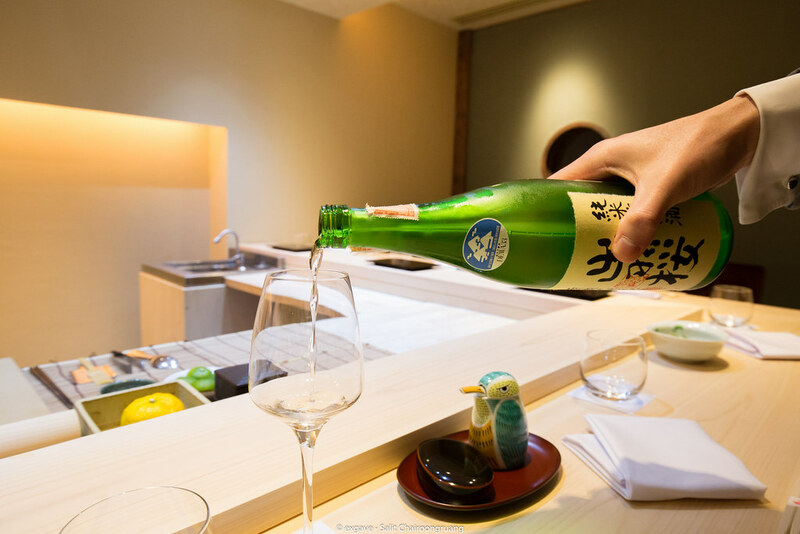 Sake #1. Crisp, clean, light and fresh. The first dish of the night is shirauo with grated ginger, yuzu zest and shoyu. Normally I personally don’t like shirauo because it was not prepared nicely in Thailand; too mushy. But not in this case, shirauo was prepared nicely. So tender but still remains its crunchiness. Balance between spiciness from ginger and saltiness of shoyu was excellent. 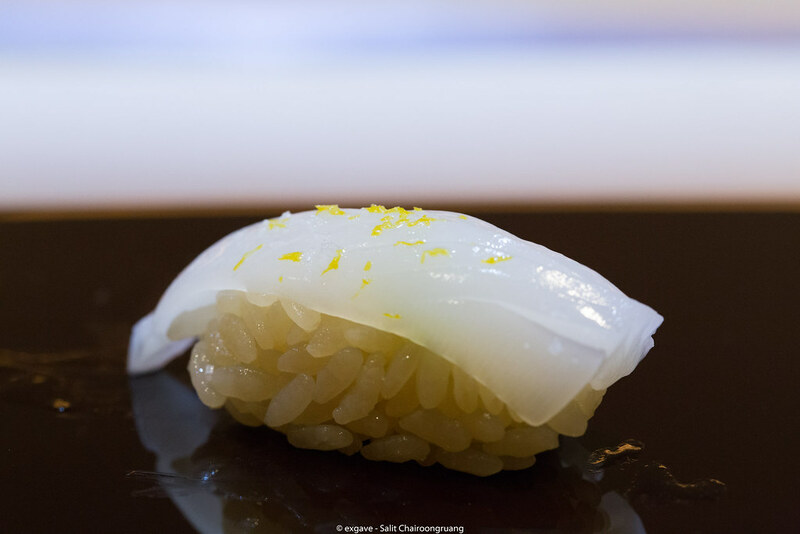 Yuzu gave a freshness to this dish. Slow cooked awabi in kombu and sake broth was fantastic. Awabi was so so tender and smooth but the real deal was the broth. 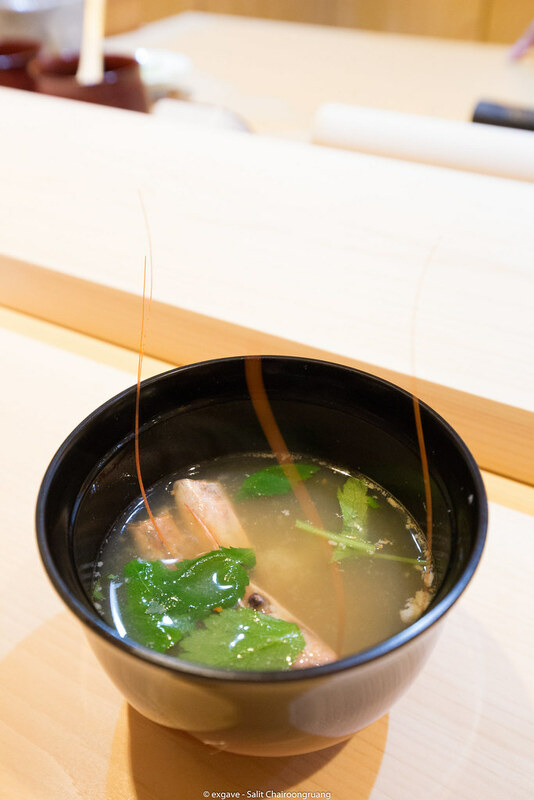 The broth was so complex and deep in flavour with mild saltiness. Really hard to not fall in love with it. 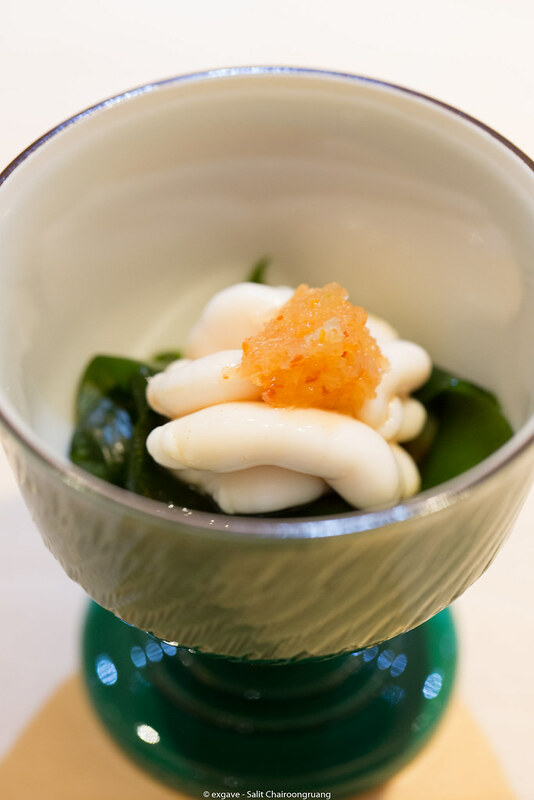 Next was shirako or cod sperm. It’s not quite a common dish in Thailand but don’t let the name fools you. Shirako turned to be super amazing. 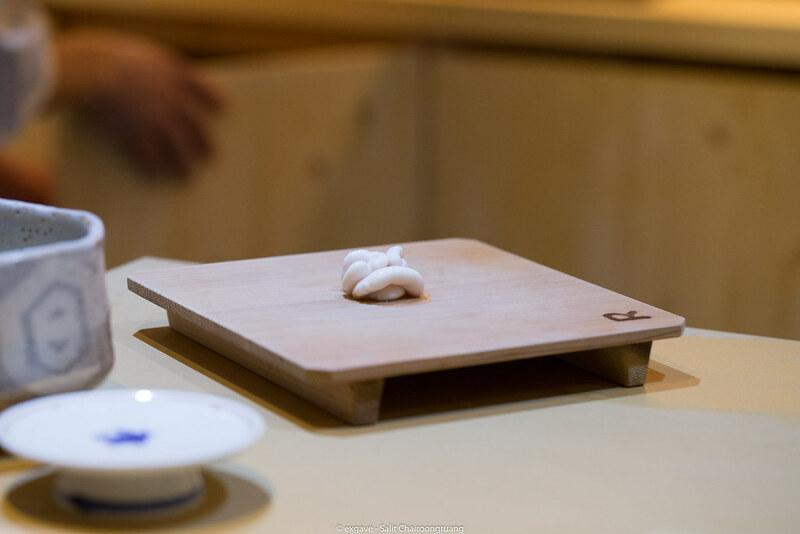 It was so creamy while ponzu sauce balanced out the richness from shirako. I forgot to jot down the fish name even chef Masato proudly presented with its picture. Sorry chef. It was the least wow impression dish of the night. It was perfectly grilled. 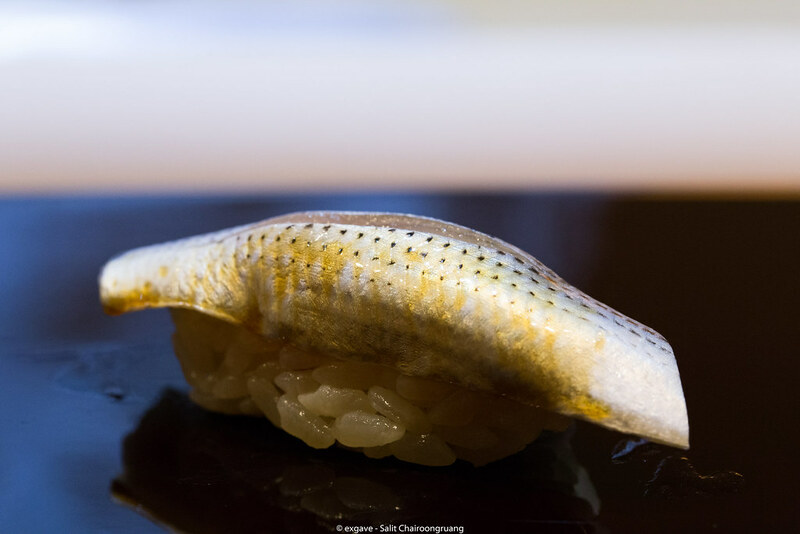 The texture was perfect and the fish itself was fatty and mild natural sweet but it didn’t have an impact though. The upside is this fish pair fabulously with sake. 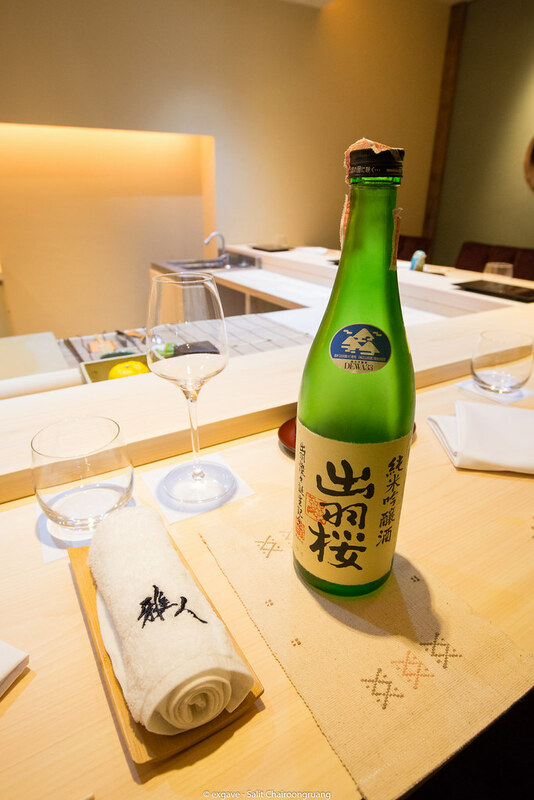 “Bitterness from its head goes along really well with this sake” chef Masato said. 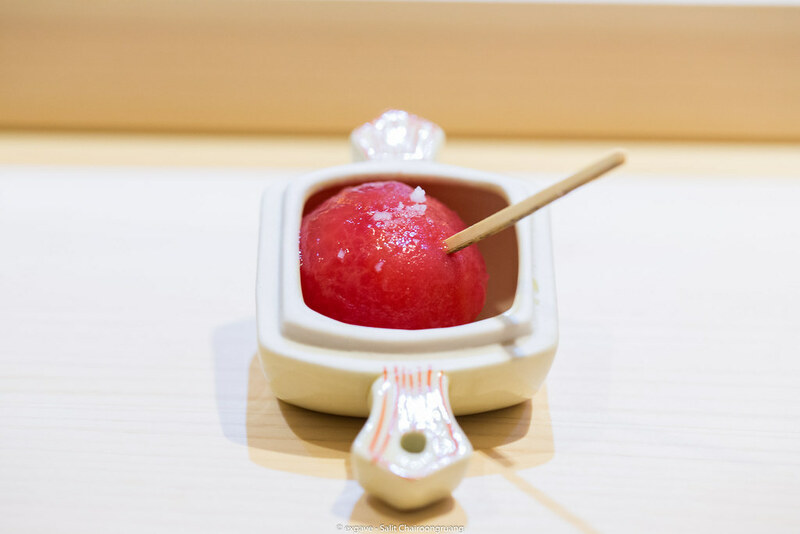 This was boiled and peeled Japanese tomato with a touch of sea salt. Japanese tomato was grown in Phetchabun, Thailand. The presentation was really cute. By the way, all dishware is very cute. Chef have selected it himself. Tomato was super sweet and fresh. Salt just increased the level of sweetness. It opened up my taste bud and prepare me for incoming sushi. Nodokuro was carefully prepared. Ama ebi was smooth and sweet. 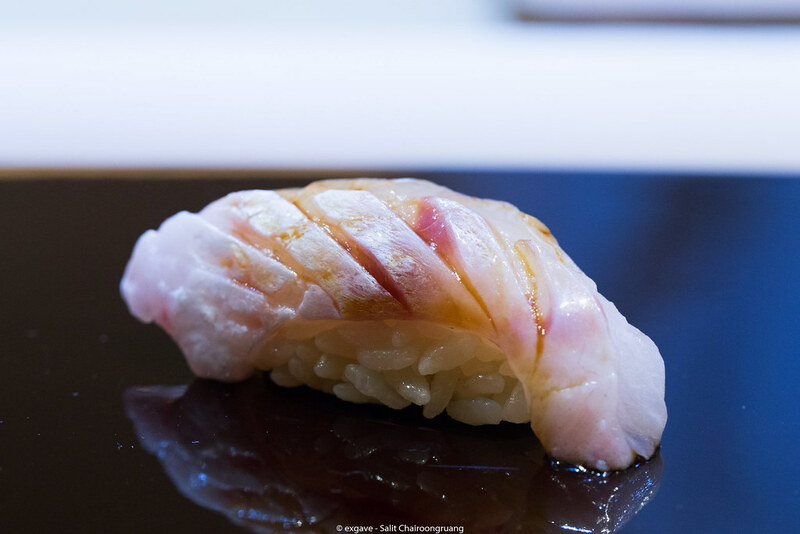 Here come to one of the highlights of the meal, it was aburi kinmedai. The grilling method here is very unique. 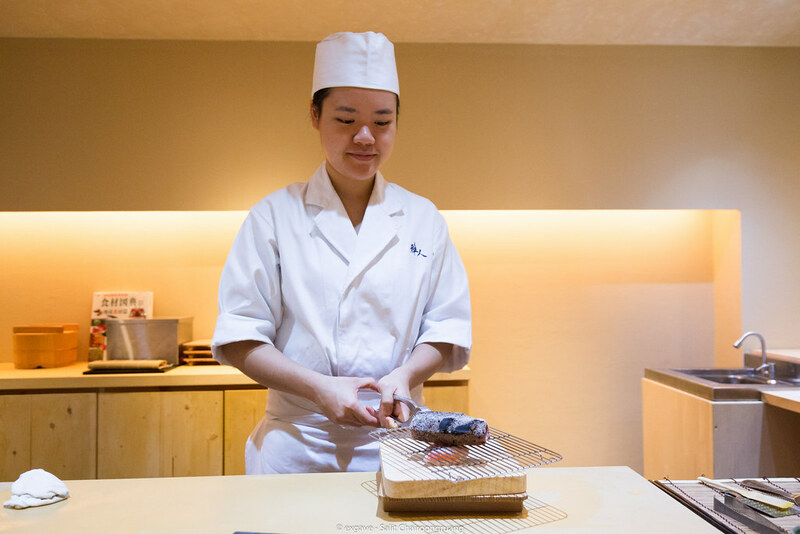 Instead of using gas torch or grilling on charcoal, they place a charcoal on top of sushi. Also chef Masato finished the kinmedai with salt not shoyu. This piece was so creative, absolutely delicious and sublime. Iwashi was placed down next. Iwashi was extremely well prepared. 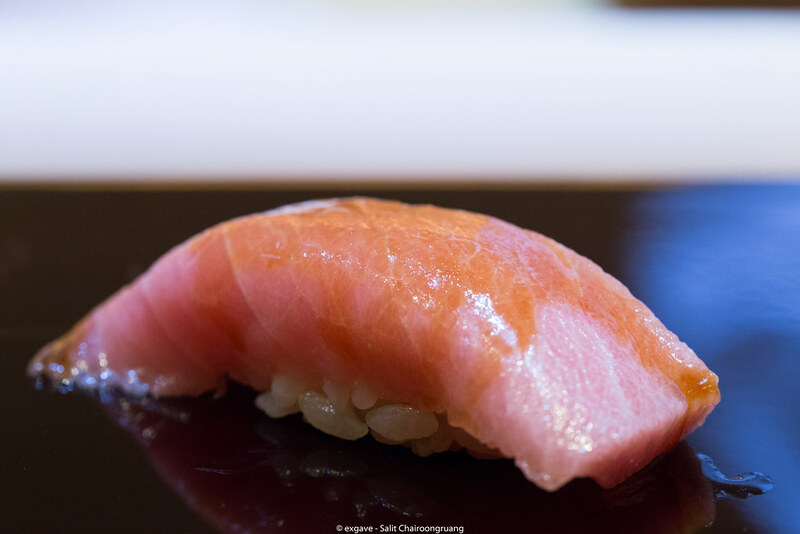 The neta was super fresh which can be noticed from the colour of its meat which is pink. It tasted absolutely magnificent – round and balanced. I am not fond of akagai but this one was well crafted. Most of akagai I’ve tried will have super chewy texture but this one turned to be very crunchy. 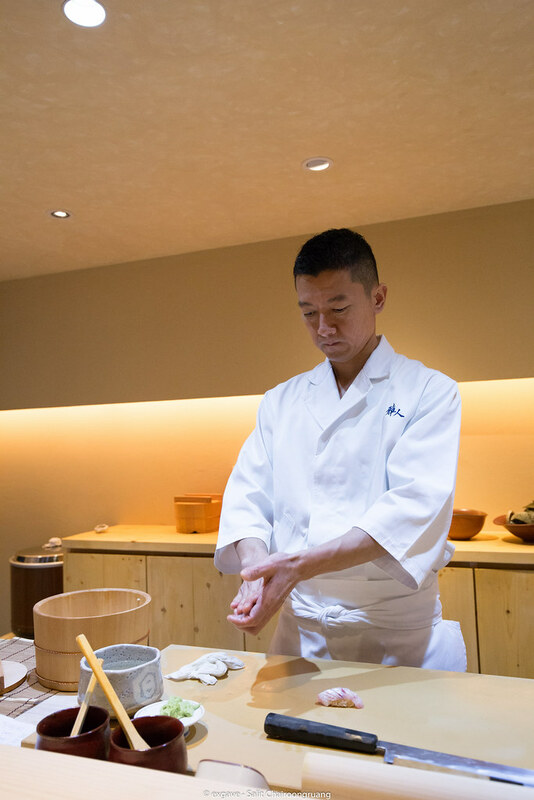 Everyone’s favourite, cyu-toro was carefully well prepared. It was packed with umami flavour. Perfection it was! 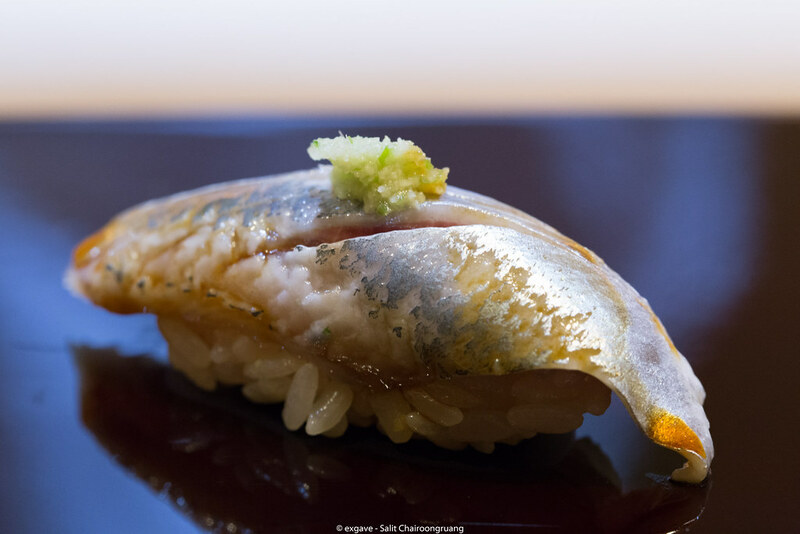 Kohada always uses to judge whether sushi chef is good or not and chef Masato executed it brilliantly; mild and round in flavour without any sign of fishy smell. Well done chef! 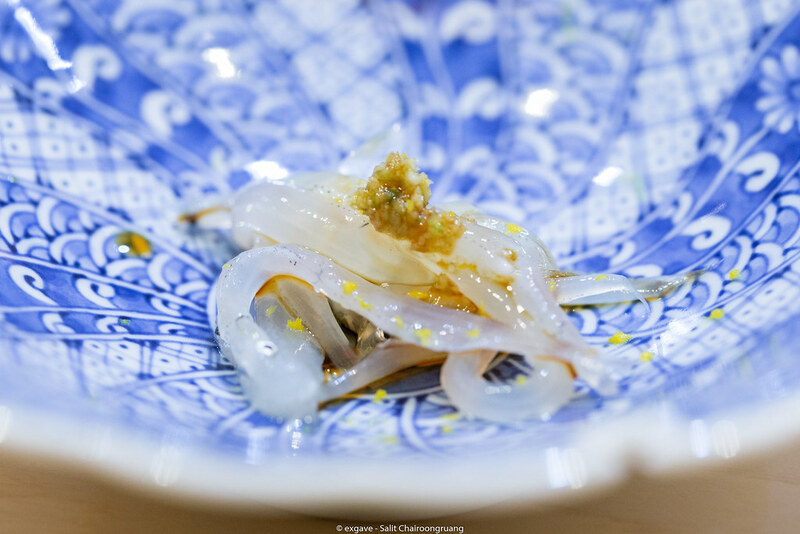 Sumi ika with salt, yuzu zest and shikwasa stood out of others. While others were balanced and mild in flavour, this ika was very tangy and sharp with a burst of citrus fruit aroma. Anyway it was good though. Another piece that is really hard to manage is saba. 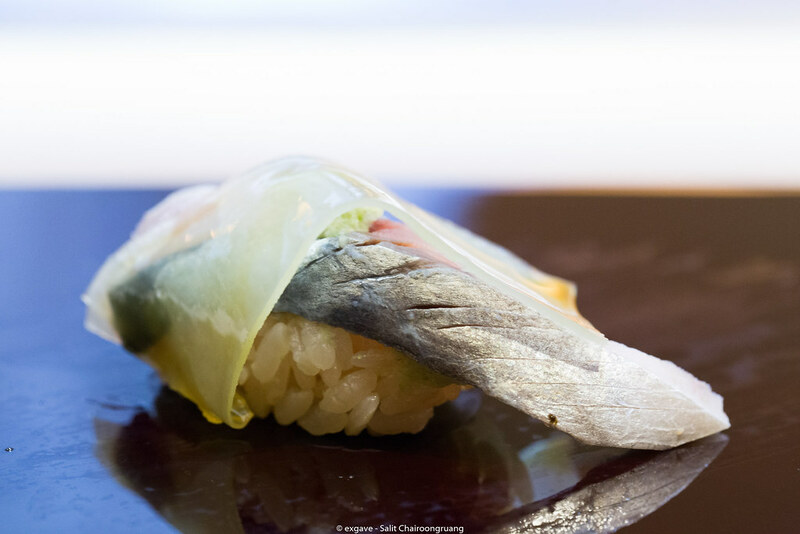 Saba usually presents a fishy smell if cook it in the wrong way but chef Masato shows how it should be done. 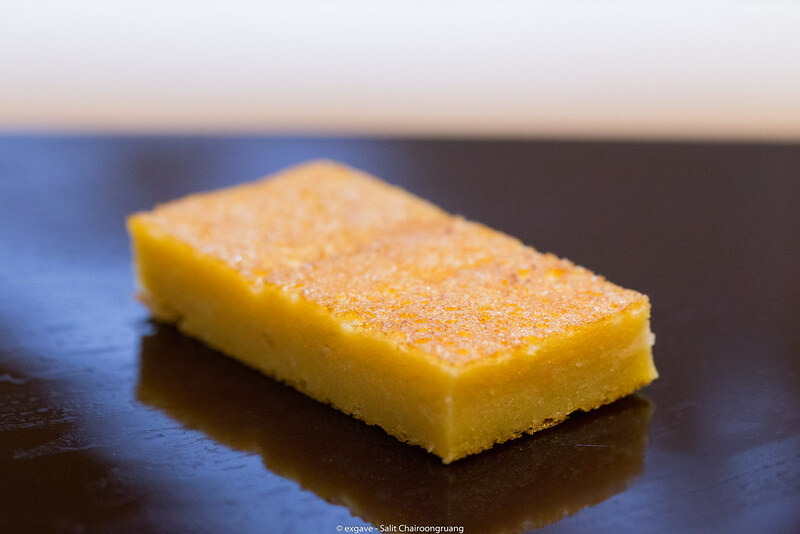 This piece was so balanced and umami. 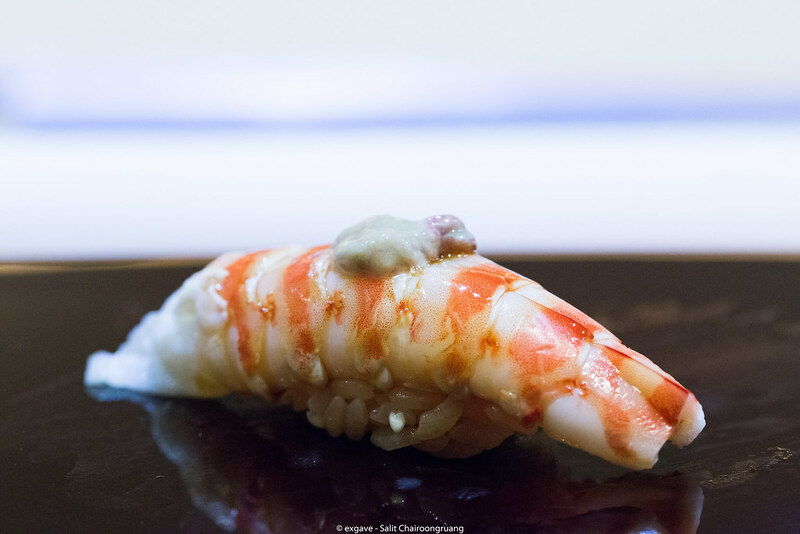 Kuruma ebi stole the highlight of the night. It was extremely well prepared. 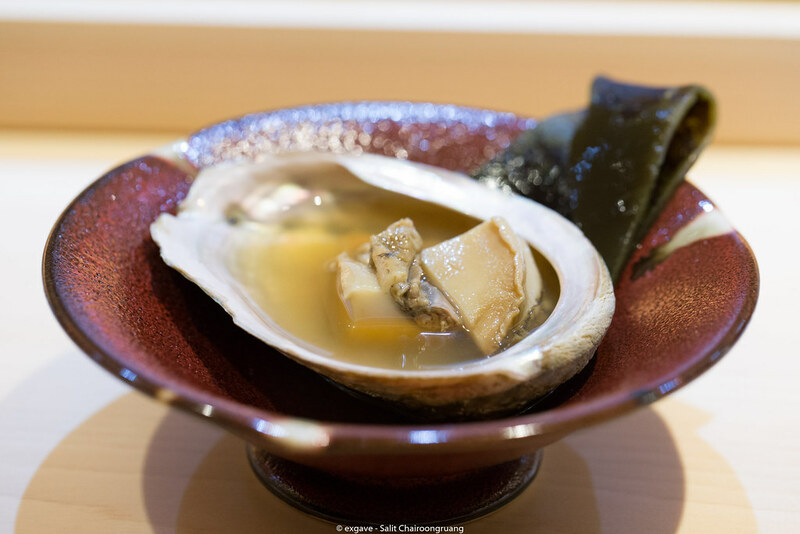 It will be boiled just right before serving in order to keep its warmness, texture and natural flavour. Chef placed its brain on the neta to finish it. 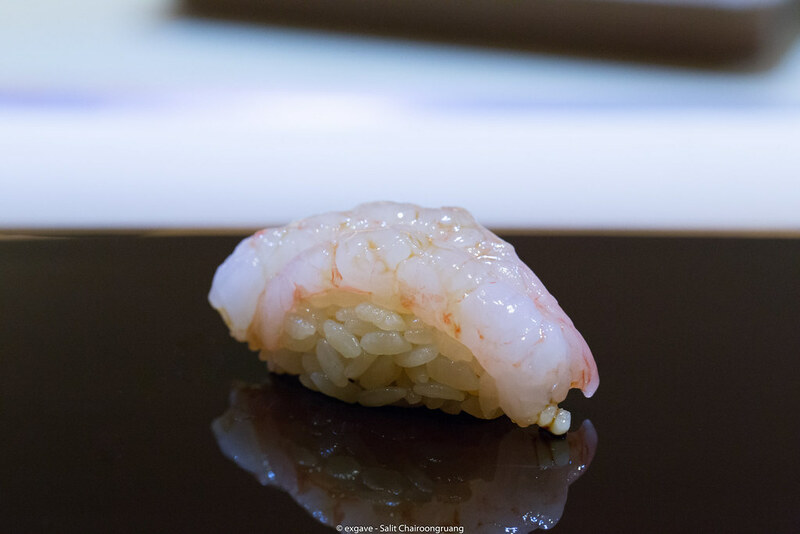 This kuruma ebi nigari was heavenly delicious; it was so sweet and firm. Heavenly duo, Murasaki and Bafun uni mini don, was served accordingly. Both uni were of high quality. 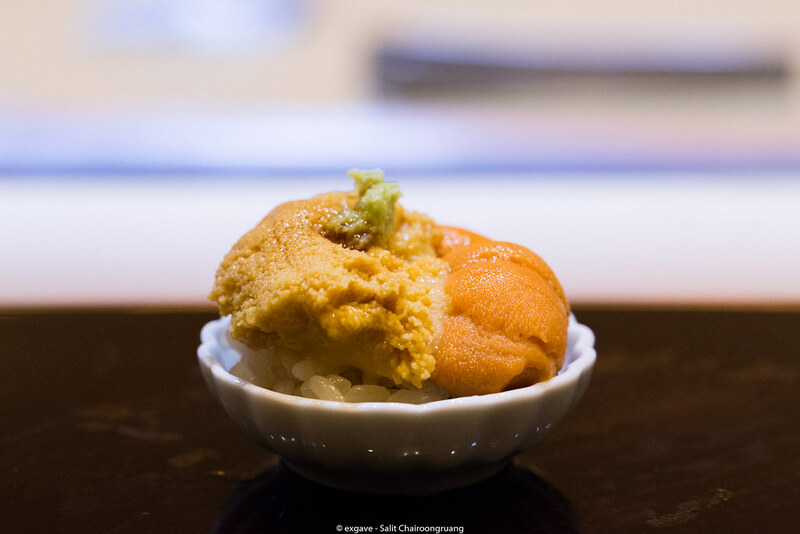 Normally Bafun uni will have a sweeter taste while Murasaki will be less sweet and creamier than Bafun uni. I personally love Bafun over Murasaki since I prefer a sweeter taste. But this time Murasaki turned to be a better performer. It was sweeter than Bafun while still remain its creaminess. Simply delicious. 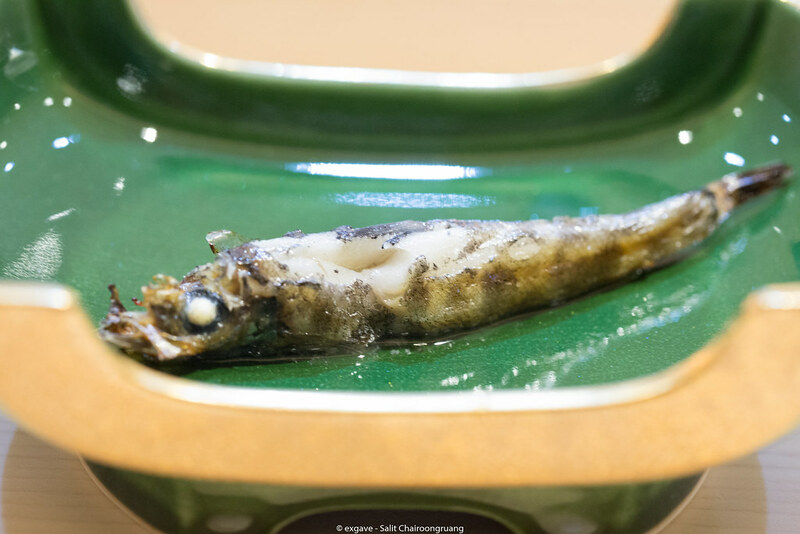 Anago with nitsume was placed down which is a sign that this meal will come to the end soon. It was cooked neatly. 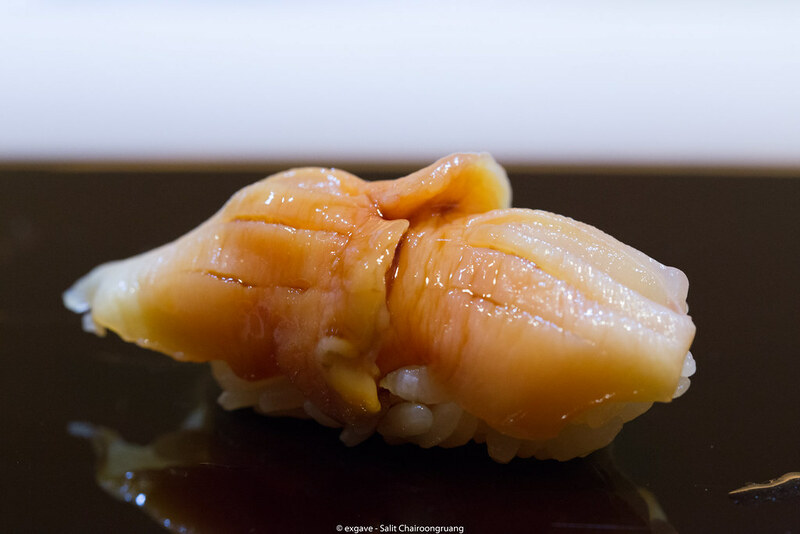 The texture was so silky and tender while nitsume was not overly sweet. 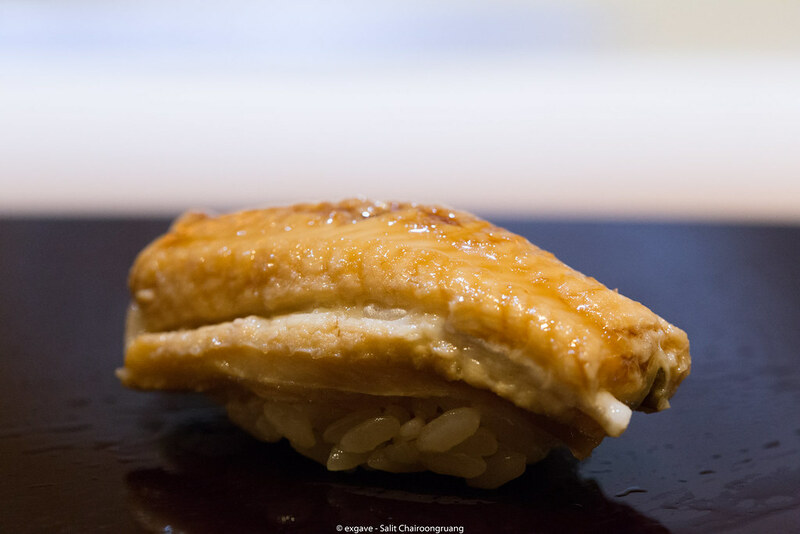 Nitsume smoothened the anago beautifully. 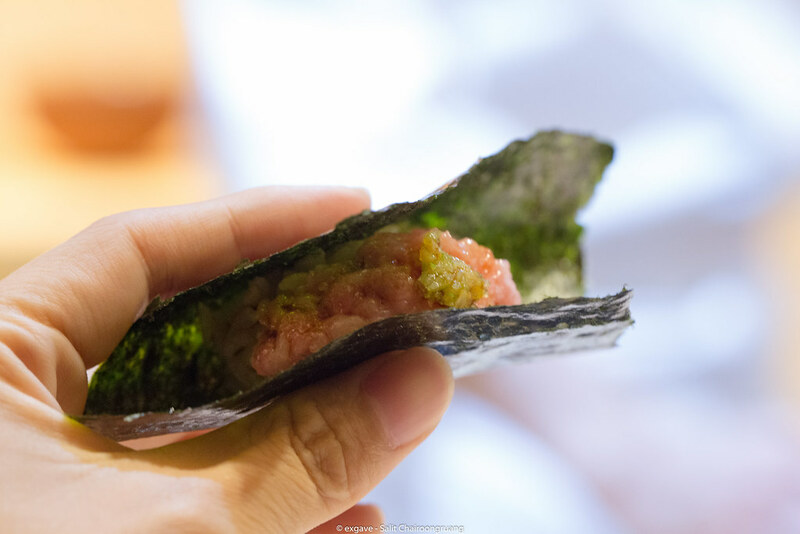 Negitoro temaki was handed to me after anago nigiri. Negitoro was well made and nori was crisp. Comes to the finale piece, looks simple but hard to execute. It was tamagoyaki. 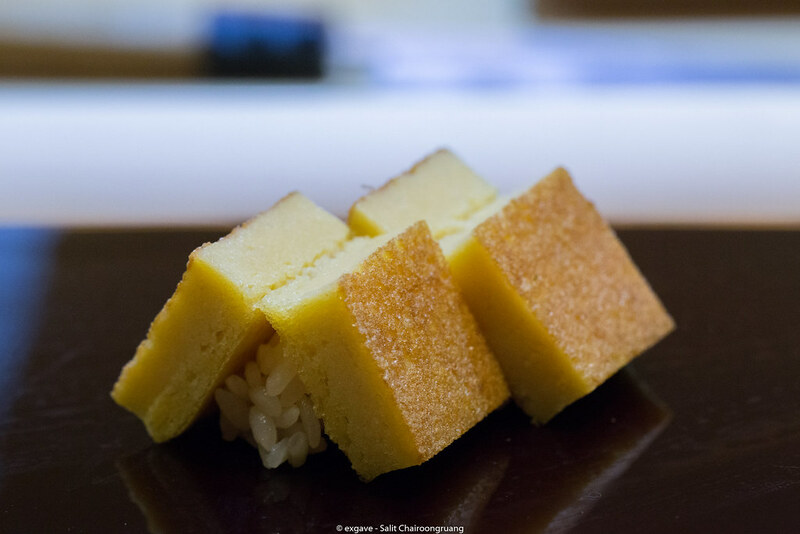 Most of this castella tamagoyaki in Thailand was too spongy, too airy or too dry. 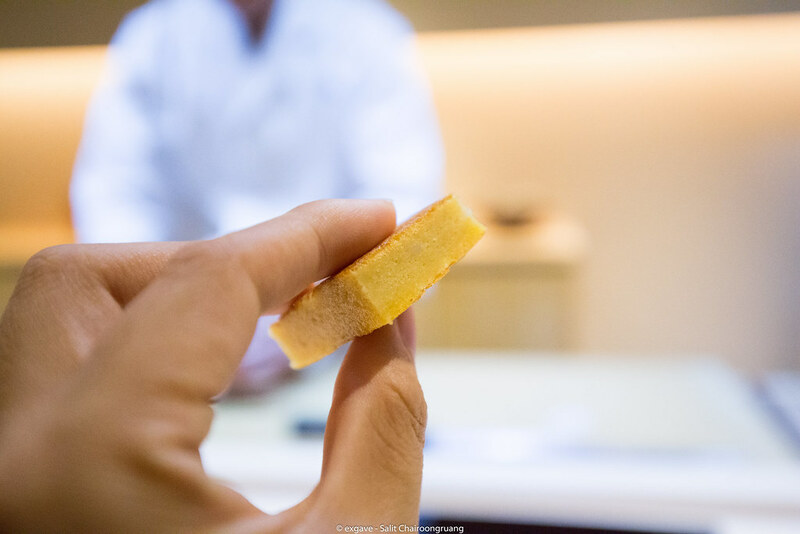 Chef Masato illustrated how a good tamagoyaki should be. It was moist, smooth and delicately sweet. Kuruma ebi head miso soup was served to finish the course. It was so clean and light. 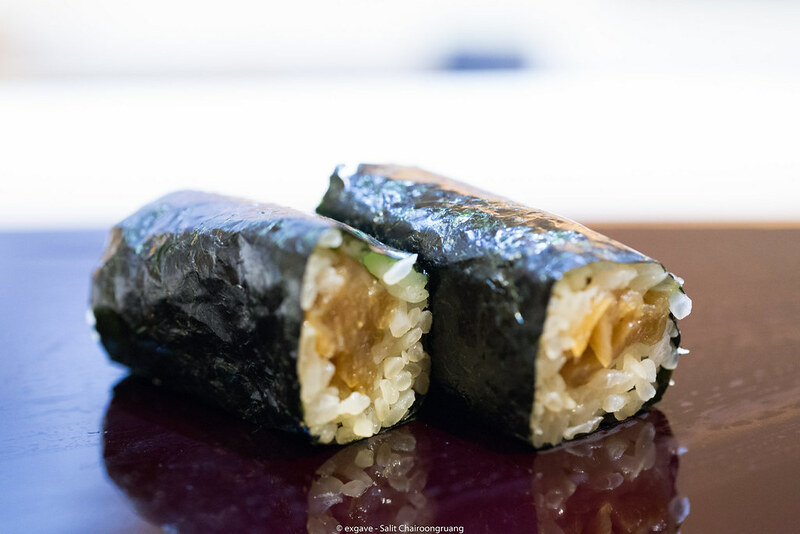 But anything will be better than a classic kampyo maki to end the meal, right? This maki I ordered extra from the omakase course. The additional charge will be applied. It had very perfect balance between saltiness and sourness. Another tamakoyaki and kampyo maki costed 400THB extra. 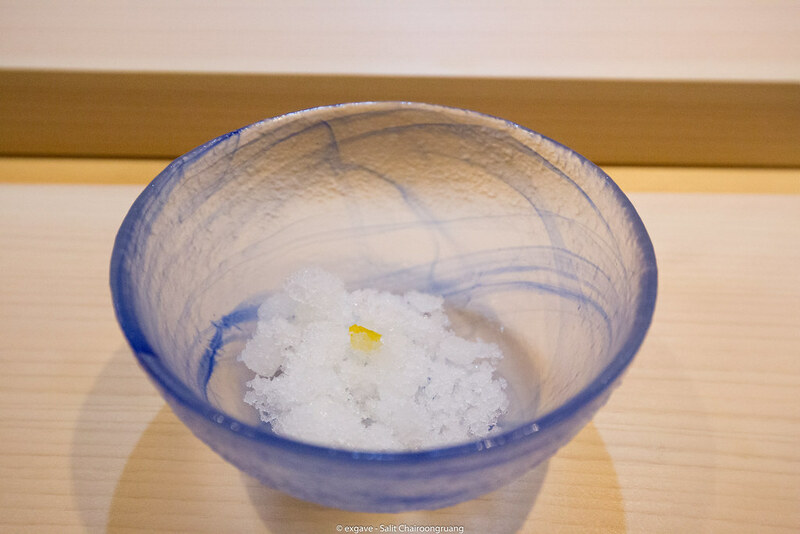 The first dessert was yuzu granita. It wiped out previous flavour on the palate. Second one was kinako kuromitsu. 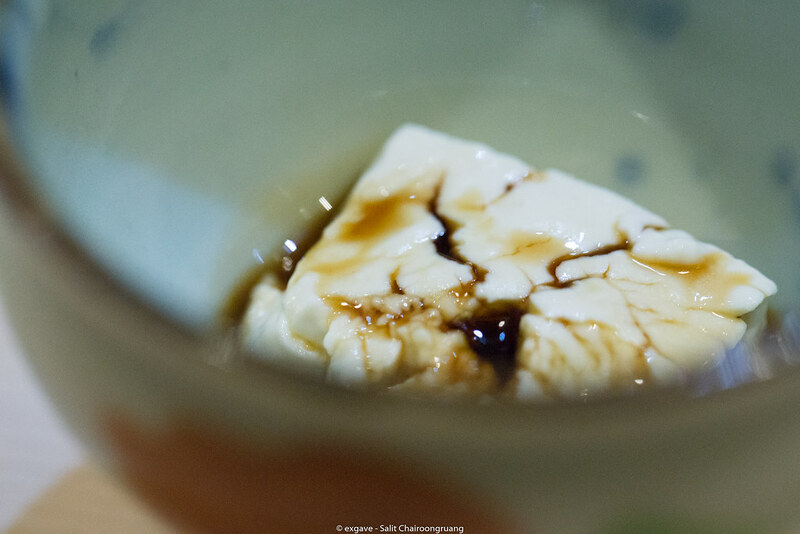 The tofu was so so silky while the black sauce was sweet. What a classic paring it was. 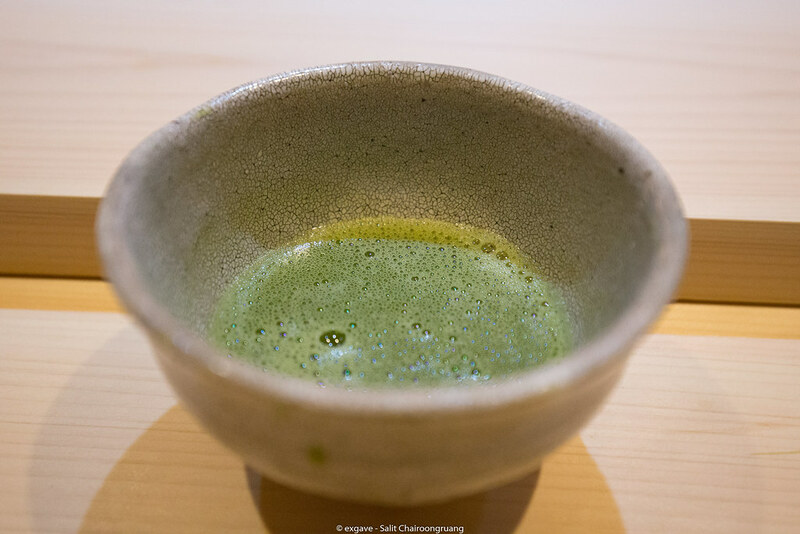 Freshly brewed green tea was served to sum up the whole meal. It was bitter and light. How I’d like to strangle the author with jealousy.